OK, so Halloween is over. However, I couldn't resist posting Michelle Phan's Sailor Moon/Manga makeup tutorial. Michelle makes incredible beauty tutorials (don't miss her Lady Gaga look!). Also... the costume season may be long over, but cosplay is still strong and going (see for yourself). 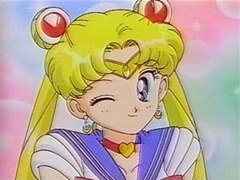 Scroll down past Michelle's tutorial for YouTube Tenchichan's live action Sailor Moon play on the Power Rangers movie theme song. Previously, Va Voom: Real Life Comic-Book-Girl for Halloween. Kitty Litter Facials: The Latest Beauty Hack.